The built environment is a significant factor in many urban processes, yet direct measures of built form are seldom used in geographical studies. Representation and analysis of urban form and function could provide new insights and improve the evidence base for research. So far progress has been slow due to limited data availability, computational demands, and a lack of methods to integrate built environment data with aggregate geographical analysis. Spatial data and computational improvements are overcoming some of these problems, but there remains a need for techniques to process and aggregate urban form data. Here we develop a Built Environment Model of urban function and dwelling type classifications for Greater London, based on detailed topographic and address-based data (sourced from Ordnance Survey MasterMap). The multi-scale approach allows the Built Environment Model to be viewed at fine-scales for local planning contexts, and at city-wide scales for aggregate geographical analysis, allowing an improved understanding of urban processes. This flexibility is illustrated in the two examples, that of urban function and residential type analysis, where both local-scale urban clustering and city-wide trends in density and agglomeration are shown. While we demonstrate the multi-scale Built Environment Model to be a viable approach, a number of accuracy issues are identified, including the limitations of 2D data, inaccuracies in commercial function data and problems with temporal attribution. These limitations currently restrict the more advanced applications of the Built Environment Model. Smith, D.A. 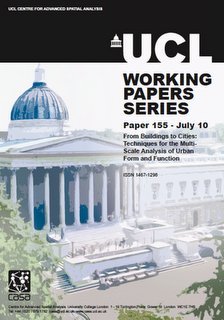 and Crooks, A.T. (2010), From Buildings to Cities: Techniques for the Multi-Scale Analysis of Urban Form and Function, Centre for Advanced Spatial Analysis (University College London): Working Paper 155, London, UK. You can download the paper direct (2.8Mb pdf) or view the complete 156 strong CASA Working Paper Series.